Press Release - GVC Announces Initiative to Spur Economic Development . . .
"The Great Valley Center today announced a wide-ranging technology and educational initiative that will be implemented in rural Tulare County. To demonstrate the value and viability of advanced technology access in rural communities, the Pixley Connect project will provide training, technical support and other services to help Pixley residents and businesses make the most of high speed Internet applications. The project is made possible by a three-year $600,000 grant from the AT&T Foundation.."
Contact Pixley Connect Project Coordinator, by phone at (559) 801-5203 or send an email using the form below. Pixley Connect is a model project of the Great Valley Center in partnership with the AT&T Foundation to bring high speed internet and technology training to the rural, underserved, predominantly Spanish-speaking community of Pixley, California. Why is technology access important in Central California? What is the “digital divide”? The digital divide refers to the gap between those able to benefit from digital technology and those who are not. How is Pixley Connect funded? In the spring of 2006, the AT&T Foundation partnered with the Great Valley Center providing grant funding over three years to seed the project. How is Pixley Connect implemented? The Great Valley Center hired a full-time, Spanish speaking Project Coordinator who is based in Pixley to design and implement the project. Through Pixley Connect, Pixley residents will receive computer literacy training, local youth will be trained to become local technical support experts, a Community Technology Learning Center will open to provide on-going technology training and assistance, and economic development will be promoted through the use of new technologies in local business practices. Who is involved in Pixley Connect? The Great Valley Center is engaging partners throughout the community with the intent of securing the support necessary to sustain efforts at the conclusion of the grant period. Pixley Connect is currently working in partnership with individual community members and the following local community organizations and institutions: Tulare Adult School, Pixley Chamber of Commerce, Community Services and Employment Training Inc., Pixley Foundation, Pixley Elementary School. " Pixley Connect, a project of the Great Valley Center in partnership with the AT&T Foundation, is an effort to narrow the digital divide in rural California. 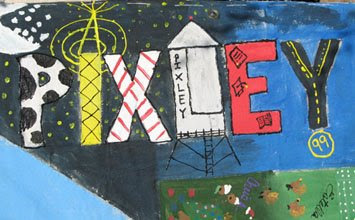 The Pixley Connect project brings telecommunication access, education and training to the underserved, predominantly Spanish-speaking community of Pixley, California. Pixley, an unincorporated community within Tulare County, is located in the Central Valley of California. The AT&T Foundation is providing seed funding for the project during the initial three years of design and implementation. AT&T has also extended DSL lines to ensure the majority of Pixley residents have access to high-speed internet at a reasonable cost. The Great Valley Center continues to engage partners throughout the community to develop capacity to sustain the project for the long term. While it is intended this be a replicable model, extensive community involvement also assures the project is customized to meet the needs of this particular community. This colorful canvas painting tells a story about Pixley residents, history and current life style. It was created by a group of youth from Pixley and its neighbor community, Tipton. P - Black and white dots represent the rich dairy industry of Tulare County. I - Remarkable representation of Pixley Connect Project, reflecting the enthusiasm and significances of having high speed internet access and technology training in the community. X - Pixley is symbolic to the rail road company that used to go through the town transporting grains and other goods. L - This is Pixley’s water tower as it stands on the middle of the town facing Highway 99 exit. E - Red Tiger’s pride, Tipton Elementary School is represented by the mascot colors and its scholarship. Y - Pixley is conveniently located on Highway 99. The letter Y represents the vitality, accessibility and value Highway 99 has in the community. Pixley is located in Central California’s San Joaquin Valley, one of the world’s richest agricultural areas. It is home to approximately 3000 residents (650 households). 82% of the population is Latino, 4% African American and 13% Caucasian. 52% of Pixley students are English Language Learners. Only 22% of the population is 45 years of age or older. The per capita income is $8,674 compared to $21,193 in Tulare County and $22,711 statewide. The median household income is approximately $23,304, less than half the state average. Pixley has only 9 operational public computer units with internet access. Pixley has an elementary and charter school, but 9-12th grade students travel to Tulare to attend High School. Pixley, California is located in the Central Valley of California in Tulare County. Located off of Highway 99, the city of Pixley is aproximetely 46.8 miles North of Bakersfield and 63.3 miles South of Fresno. Pixley is home to approximately 3,000 residents. The Great Valley Center staffs Pixley Connect Project with a full time, bilingual, on-the-ground coordinator, Sandra Orozco. Sandra works with community based organizations such as the Pixley School District and Pixley Chamber of Commerce and other local entities to make Pixley Connect a successful model project for the California Central Valley. Maria G. Velásquez began coordinating the Computer Technology Center through the Pixley Connect Project in 2008. Maria helps communities to be advocates for themselves and their families by developing leadership skills and engaging in civic participation. Her role includes offering a wide range of programs and services, from leadership development to computer literacy classes for youth and parents. Maria’s varied background includes many years of experience in community organizing and advocacy, social services, and training. Maria is from Visalia and works in Pixley. Alvin G. Chavez started as one of Pixley Connect's Digital Connectors Program, he was one of the students in the pilot program from July 2008 to March 2009. Having completed 72 hours of intensive training and 200+ hours as a Digital Connector Ambassador, he volunteered his time to the Pixley Connect Program. He was chosen to represent the Digital Connectors in the Pixley Connect Advisory Committee. In January, he was chosen by his colleagues to represent the Pixley Digital Connectors in the bring IT home California 21st Century Community: Cutler-Orosi Inauguration Ceremony in Orosi. In March, he was chosen by Pixley Connect to consult and train the 2nd class of Digital Connectors, and has since dedicated himself into keeping this program running with the help of his coordinator Maria G. Velásquez . In May, he and one of his colleagues were chosen to represent the Pixley Digital Connectors at the Great Valley Center Conference on May 6-8 in Sacramento, CA.